Villa Ilias enjoys a quiet location in Firostefani, just a few minutes walk from the hustle and bustle of Fira. 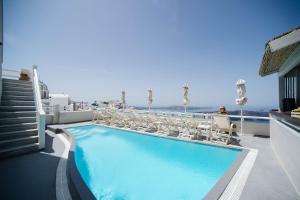 It has a pool with magnificent views over the Caldera, the volcano and the sea. Please inform Villa Ilias in advance of your expected arrival time. For this, you can use the special requests section when making the reservation or contact the accommodation directly. The contact details appear on the booking confirmation. Room located on the 2 floor, with air conditioning and east facing window overlooking the town. 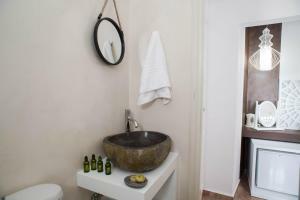 It includes a private bathroom with a shower, a flat-screen TV with satellite channels, a DVD player and free Wi-Fi. It has easy access to the pool terrace, which enjoys panoramic views of the caldera, the volcano, the village of Firostefani, Akrotiri, the island of Thirasia and the sunset of Santorini. Room located on the pool level, with air conditioning and a window overlooking the pool. It has a flat-screen TV with satellite channels, a DVD player and free Wi-Fi. It has direct access to the pool terrace, which enjoys panoramic views of the caldera, the volcano, the village of Firostefani, Akrotiri, the island of Thirasia and the sunset of Santorini. This room is located on the ground floor, with air conditioning and an east-facing window with views of the town. It has a fridge, a flat-screen TV with satellite channels, a DVD player and free Wi-Fi. Located on the 1ª or 2ª floors, this air-conditioned room has a window overlooking the volcano and a private south-facing balcony with panoramic views of the caldera. It has a fridge, a flat-screen TV with satellite channels, a DVD player and free Wi-Fi. Located on the 2 floor, this room features air conditioning and a private balcony with caldera views and partial views of the volcano. It also has a window overlooking a traditional path. It has 1 large bed and private bathroom with shower. In addition, it is equipped with a refrigerator, a flat-screen TV with satellite channels, a DVD player and free WiFi. It has easy access to the pool terrace, which offers full views of the caldera, the volcano, the town of Firostefani, Akrotiri, the island of Thirasia and the sunset of Santorini. Studio located on the ground floor with air conditioning. It has a private patio area and a balcony with views of the caldera and the volcano. It has a well-equipped kitchenette with a fridge, as well as a flat-screen TV with satellite channels, a DVD player and free Wi-Fi. Located on the rooftop, this elegantly decorated, air-conditioned suite opens out to a private terrace with a hot tub and panoramic views of the Aegean Sea, the caldera and the volcano. In addition, it is equipped with a flat-screen TV with satellite channels and a small fridge. There is free WiFi. Please note: 3er and 4º guest are accommodated in 1 sofa bed. Room located on the pool level, with access to the pool terrace and a small window overlooking a nearby church or pool. It includes a private bathroom with a shower, a fridge, air conditioning, free Wi-Fi, an LCD satellite TV and a DVD / mp3 player. Room located on the 2 floor, above the level of the pool. 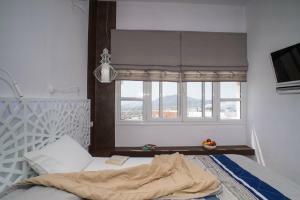 It has a very large window with panoramic views of the Caldera. It includes a private bathroom with a shower, a fridge, air conditioning, free Wi-Fi, an LCD satellite TV and a DVD / mp3 player. This apartment offers volcano views, air conditioning, a CD player and a DVD player.